Starters are must for any parties or potluck. Many times the crispiness would be lost by the time we start consuming it. 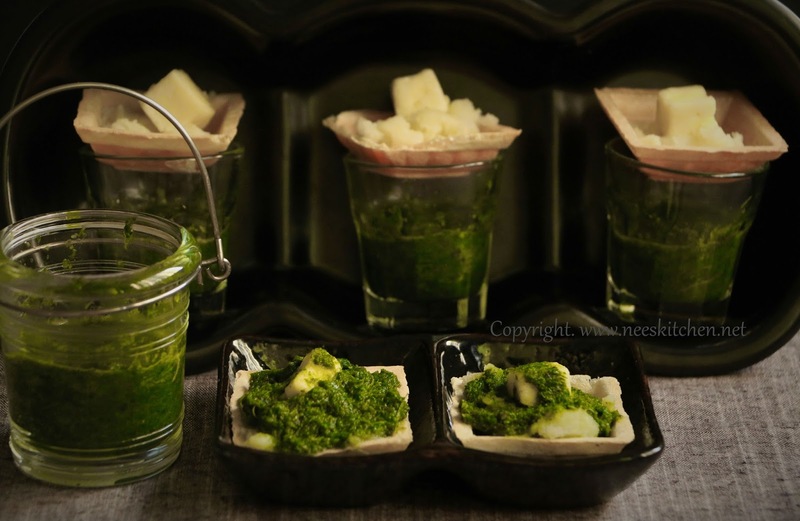 Recently I made Canapes Potato Paneer bites with green chutney for a family gathering and it became a super hit. 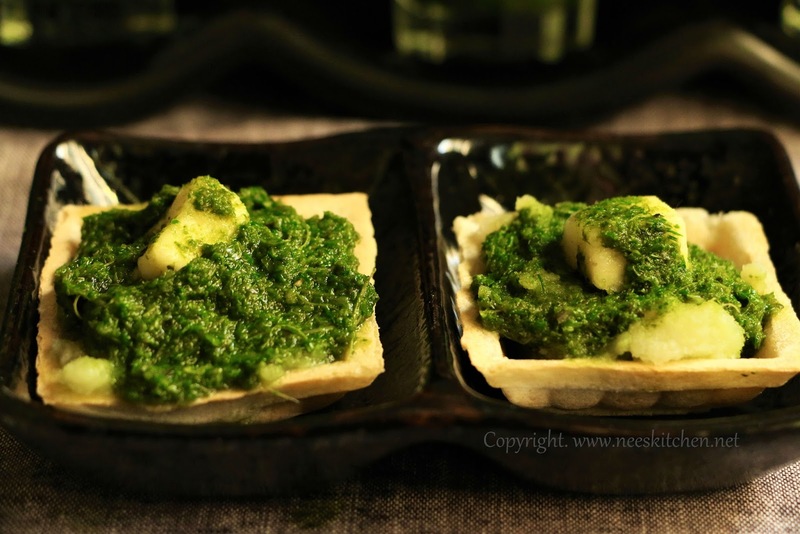 Thin & crisp baked Canapes Cups topped with boiled potato & paneer and topped with green chutney made out of Dill, Coriander, mint and Thail Basil leaves. Since we are surrounded by beaches we often spend our weekends there and also carry our food. I earlier used to prepare vada’s ,bhajji’s or puffs but every time the crispiness is lost. This time I tried Canapes potato paneer bites. In the first place, it was less time consuming to make and we can also make it a day earlier. I packed potato, paneer and the chutney in separate containers. Canapes were any way’s packed airtight by the manufacturer. I just opened them and served just before eating. It was just right in all aspects and all of us enjoyed. 1. Boil the potato and mash it. 2. Add a spoon of ghee to paneer cubes and microwave for a minute. 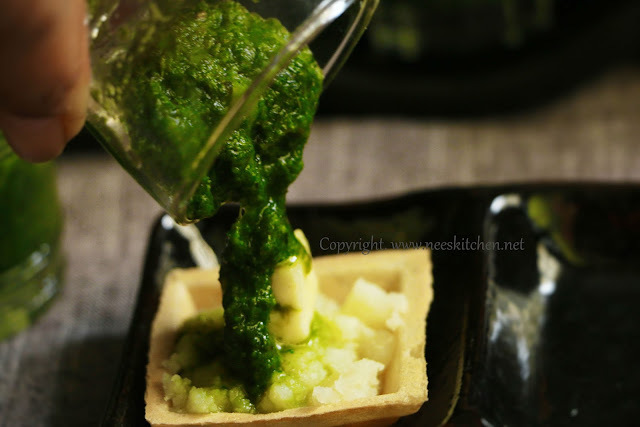 This is not for frying the paneer, we just need to infuse ghee into paneer so that it does not taste raw. 3. Wash and add Dill leaves, coriander leaves, mint leaves, thai basil leaves, salt, chili, ginger, garlic into a mixer. Blend it with little water to a chutney consistency. 5. Arranged the canapes cups. 8. Add the chutney on top and consume it immediately. 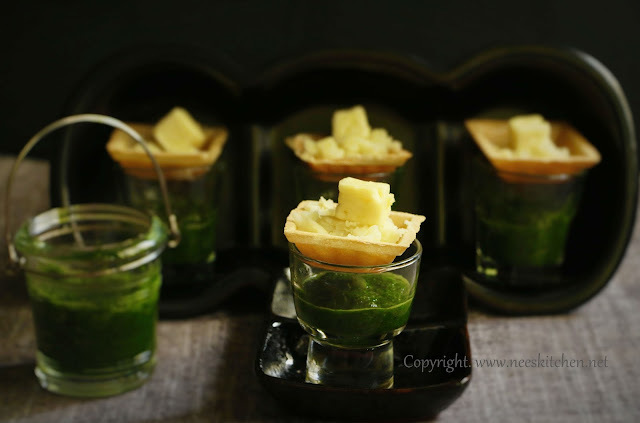 Serve this similar to Pani puri else the canapes cups would become soggy as the chutney is not dry. -> Since the cups are slightly tender never add the ingredients in advance, they would turn soggy. It is meant for dishes which are consumed immediately. -> Do not add the ingredients well in advance as the watery content in tomato paste and other vegetables may make the canapes soggy. Disclaimer : All the information about the product are based on my personal experience only.